Torpedo Kegs too wide? Want to squeeze another keg in your kegerator? The Patent Pending design of the new Slimline Torpedo Keg is 9% more slim than the classic model with all the same great features. Coming in at about 1/4" thinner than standard Ball Lock Cornelius Kegs, this keg has welded stainless handles and the ability to stack kegs with fittings still in place all at a great price. Here at MoreBeer! we love nothing more than quality interior welds. We've spent a decade rejecting kegs made overseas because the interior welds have never met our standards. If a weld is not perfect and shows evident burn marks along with nooks and crannies it cannot be sanitized effectively. 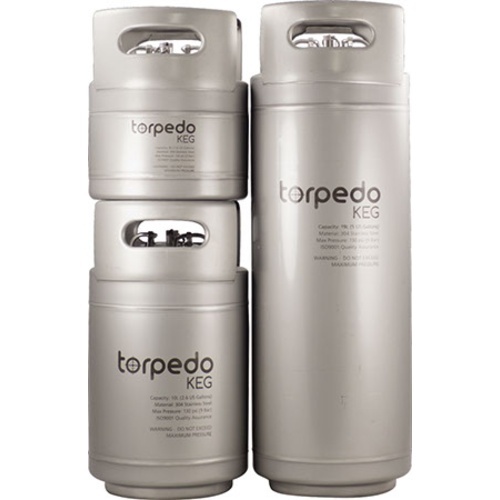 Torpedo kegs are machine welded and exceed our standards for quality. This weld quality is possible because these kegs are made by an ISO certified commercial keg manufacturer. 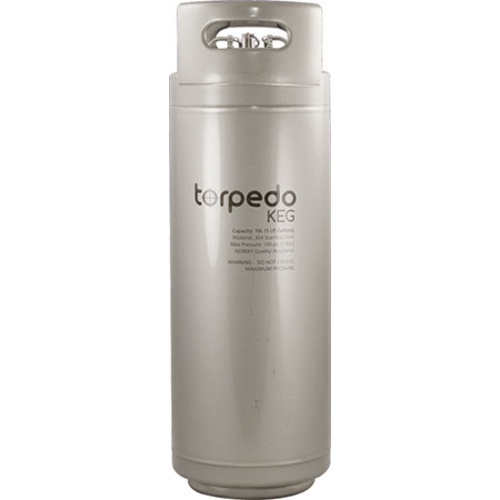 Torpedo Kegs were designed to stack with Ball Lock quick disconnects in place and serving which is a cool feature for some brewers who have vertical space in their refrigerator. We also like the rolled stainless steel handles. They are comfortable to grab and will never come off like some rubber handles can over time. “In” and “Out” is etched near the keg posts for easy identification which is very handy when you are connecting lines in a refrigerator or kegerator and trying not to make a mistake. Taking your keg on the go? Don't leave home without a custom tailored Slimline Torpedo Keg Sleeve! 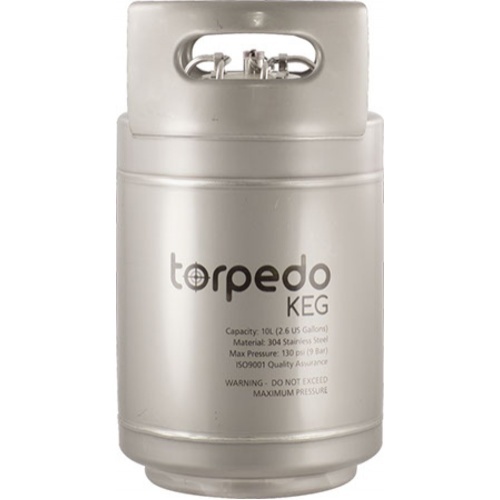 For a slightly shorter keg, see our Standard Torpedo Kegs! I already own two, and wanted more! They're great, and fit in my tight kegerator perfectly! Itâ€™s the only keg that will fit in my keg refrigerater. Iâ€™ve purchased 4 or 5 kegs from here and itâ€™s always quality equipment with fast free shipping. It works, I don't have to worry about CO2 leaks in these containers, compared to used kegs. And they look nice in the kegorator. Like the slim design and the superior out tube placement. Because I can get more of them in the keezer I'm building. My son in law requested it! Already have 2 and they are great! The size & dimensions of the 2.5 gallon keg work best for me. I like the dual handle feature. The stackability feature is great. Sizing down to 2.5 gallon batches and these looked great. I already own two, and wanted more! They're great, and are great for small batches, split batches, or taking beer to parties! Good welds, small form factor, in order to fit in regular fridge, aesthetically pleasing. I already bought two of these in the past and love them. Already have 4 of these. Best home brew kegs available. splitting a 5 gal batch to compare. Having difficulty getting 3 regular 5 gallon Torpedos in my recently purchased Kegland Series 4 Kegerator so this skinny version should solve the issue. they well together in kegerator and take to parties. does anyone know what size posts these kegs have? I need to replace the gas side? thanks! 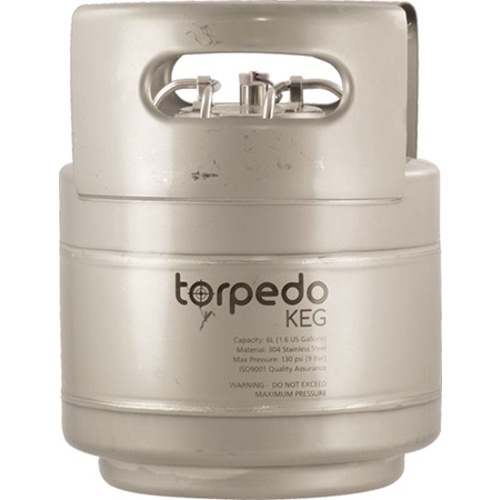 BEST ANSWER: The posts on the Torpedo kegs are the same that fit on standard Corny ball lock kegs. The post measures 19/32" in diameter with 18 pitch threads. The part number for the gas in post is KEG460N. I had the same issue with the two kegs I purchased. When I used a digital caliper to measure them, they are subtly larger and make it impossible to put anything on the posts. Morebeer sent me replacements which was appreciated. Awesome little kegs. They clean easily and they nest well. They fit in my beer fridge perfectly. I like the slimline because it takes up less space in my fridge. I have only put 1 beer through the torpedo keg so far, but it works as expected. I'm a big fan of the idea that they can stack with the QDs in place. They do cost more, but I think they look a lot nicer, and I never have to worry about loose bottoms/tops like with the old soda kegs. The used soda kegs were nice since they saved me money when I was just getting started, but now I'm at the point in my brewing where I am comfortable splurging a bit on nicer equipment since I know I am going to be at this hobby for a long time. I'm learning the "buy once, cry once" mentality. I've fought with three (cheaper) used kegs for years and finally bit the bullet and purchased three 5 gal slim Torpedo's to replace them. Well made, looks good and seals easy. Very happy! Well constructed and slimmer then a standard corny keg. I have used mine 4-5 times so far wth no problems. I ordered 2 and loved them. I ordered another and I'm very happy with them. It fits perfectly into my dual tap cooler to supply water to the built-in rinser. It, along with two 2 1/2 gallon kegs, completes my design for a self-contained tail-gater serving system. The 1-gallon keg supplies water to the built-in rinser. It fits inside the cooler with 2 more kegs. I own four of these and will just keep buying them as my needs expand. They're the perfect size for my keezer and I can stack the 2.5 gal versions to really pack them in. So much better that dealing with used kegs! Easy to disassemble for cleaning! I’ll be buying more soon! Cheers! This keg seems to be of good quality at a reasonable price. Lightweight and looks great. Well made keg, better then "old fashion Coke/Pepsi"
Description is spot on - Great east to read IN-Out etch marks, easy to stack with faucet on, easy grip handles, well made, a "sort of" good price..........Best keg on the market. Addresses all short-coming issues of other brands. I was amazed at how light it is. Compared to a Commercial 5 gallon keg, it is much slimmer. 3 out of 4 ain't bad? I've been gifted 4 of these kegs over the last two years. Overall, they're great. Kegs 1,2, and 3 are rock solid but I'm pretty sure the keg I received most recently has a bent lid opening. Nothing I have tried has gotten that keg to seal properly. I knew something was wrong when my 5lb CO2 tank was empty in a week. I thought I fixed the problem only to have another CO2 tank empty in days. I've checked everything else in my system and I believe keg 4 is the problem. My gifted keg is costing me time, frustration, and money. These kegs are perfect for my new kegerator. They are light weight, leak free, offer flexible set up, and completely metal. Fit my quick connects without any special adjustments. As other stated they are slightly taller than most ball lock kegs, so it is cramped towards the top of the kegerator (A dual regulator takes up extra space too). But this is not a major issue, just takes some strategizing when putting the new kegs inside. Does everything it’s supposed to, best when filled. Nice kegs, these are the first ones I've ever owned so I can't compare to other corny kegs but these seem to be high quality. The welds are clean, and all 3 that I ordered came pressurized. After cleaning, I was able to get a leak free seal just by pulling up on the handle to seat the seal well, then latching it down. I was a little concerned that they would be dented, the boxes they came in we're a little beat up. But the kegs look fine, no dents. Some surface scratches but nothing bad. 1st the keg posts were slightly different and made it fundamentally impossible to use them. MoreBeer was wonderful and replaced the out posts. I used a set of calipers to measure the differences and they were different. The in posts were also slightly different and difficult to use. 2nd the bottom of the keg does not have that cone shape going to the center, thus when using KegCleaner pads they don't really fit the shape properly. 3rd the lid uses a different handle design which I just didn't like. Overall, the concept is good, but the implementation is average. Bought my first 6 2.5g ones a few years ago. love the design of these and that they are all SS. Also like the new style of poppets in the posts. I am glad they came out with this slimline version (can't understand why it wasn't the first one, but anyway)! I am steadily replacing all my old kegs with these for the ease of stacking and also adding the SS torpedo QDs so they can be connected when stacked. This is a great keg for small batches and portability. Have used it at parties with a co2 gun and it works great. Good size for a cooler filled with ice. These work perfectly with my zymatic pico brew .very convenient low profile and able to store in a small space .I really like this product . The 2 1/2 gallons fit 2 in my kegerator along with a co2 tank. Bought the 1.5 gallon slimline cause I needed something portable for the pool and I figured the 2.5 gallon was just too big. Wanted something bigger than a growler that would last me a few hours or something I could share with friends. I rack off my larger kegs to this little gem and my summer just got that much better. Awesome product! It is well made and held pressure with no leaks. The only negative would be the oring is a little large. I had to replace the oring so picnic tap would snap on. Great kegs, highly recommend. No downsides compared to traditional corny kegs and the upsides include easily replaceable parts. got this 2.5 gal keg to keep our kombucha on draft. just ordered a 5 gal for my next brew day! Easy to use. Great size. Ships fast. This keg is great for small batches or for splitting batches! I just purchased these two 5 gal kegs. Currently they are being used as storage containers ... until I have room in my kegerator. So I’m basing my review on first impression. First, I really like how it is all metal. Nice welds and no more black rubber marring when cleaning.. They arrived in flawless condition. I had no issues with sealing. I’m a fan. After time & use, I will have more valuable feedback to provide. If all proves well, I look forward to adding to the collection. I love these things. No rubber marks on the floor, no dirt on my hands from worn out rubber feet. I now have....two of the original wide-format Torpedoes, which can fit on the compressor hump of my keezer, and....four of the slimlines which fit in the lower section...and a 1.5-gallon Torpedo for taking to parties and such. Great quality. Crazy fast shipping. I recommend! I wanted to love these kegs due to the slim profile (extra keg in keeper), but I have nothing but trouble with every one of the 4 of these kegs that I purchased. Ball locks don't fit properly on some and posts needed to be changed. They have leaked beer from the posts and left puddles of beer in my keezer. Top didn't seat properly on one and drained an entire 20lb cylinder of CO2 before I noticed the leak. Lent one (new and still in wrapper) to a friend and same issue on a different keg drained a 5lb. Another friend bought one and had to completely reshape the top to get it to seat and hold pressure. Some may claim this as user error, but I have been brewing for 20+ years and legging for 10+. No other kegs have ever caused this much trouble. Search craigslist soon and you will find all of mine for sale. I have at least 2 of each size and love them. No issues and will buy more as my beer selection grows. I smile every time I open my little Kegerator! These are well made and look great. These fit the space constraints of my refrigerator that i converted. I had vertical clearance but it was difficult to fit 6 kegs in the horizontal area. They measure up in every way to Cornelius kegs but the ont hing that would REALLY make them stand out is a tab on the inside of the lid. It is not that big of a deal to weld a tab on the inside to attach hop bag or other additive but nobody does it unless you buy a separate lid. Everything worked just as expected and the slimline design allows me to fit 3 kegs in my kegerator. Exactly what I needed. 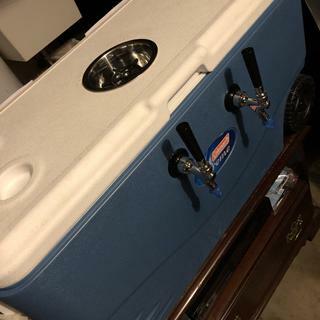 Work great in my portable kegerator. Excited that I got two brand new kegs. But after cleaning and setting everything up, found that one of the gas in ball lock disconnects was defective and one of the beer out disconnects was abnormally tight. It was really hard to connect to. I placed keg lube on both fittings but it didn't seem to make a difference. Great kegs, height measurement not exactly accurate. These kegs are great. However, buyers should be aware that the height dimensions shown on the website are not accurate. The slimline keg I bought was about an inch taller than what is on the shown on the website and is taller than the ones I previously ordered. We will review the dimensions and make sure they are accurate. Thank you for letting us know and for taking the time to review the product. Adequate, but not any better than a used Corny keg. Nice design except for the connector posts. Much tighter fit than Corny kegs. Had to replace some O-rings to get the connections on. Might have to try some lube. Great investment and for parities! Works great! Recommend others try these kegs. I converted the side by side fridge in our laundry room into a kegarator. I can fit two 2.5 gallon and two 1.5 gallon slimline kegs in the bottom of the fridge and still use the top portion of the fridge for bottled beer, etc. Nice keg. My customer liked it enough to order another one. No issues with the build quality, no leaks, no issues with the lid fit. The only issue I have with these kegs is that, for whatever reason, the ball lock connectors are really stingy when connecting and disconnecting the fittings. I even have what I think are the better CM Becker fittings but still it is really difficult to get the fittings off of the connectors. When putting the fittings on, I spray them with sanitizer first, which makes it a little better, but still they go on pretty hard. I'm thinking to get an o-ring kit and replace all the seals and see if that makes a difference. If anyone has experience with this, please let me know. My old corny kegs do not have this problem and my fittings go on and off smoothly.